What’s on my mind right now? CUBA! I leave early Wednesday morning. If you’ve been, I’d love for you to share any tips/recommendations, etc. in the comments. I’m basically planning on being offline (WiFi is not easily accessible there) sooooo I’m working like a maniac to make sure I have lots of fun stuff scheduled for you before I go away! I am truly SO excited for this trip… it’s my first yoga retreat and my first time in Cuba. As far as this weekend goes, it’s a mix of work + fun. I am taking a 2 hour restorative yoga class that incorporates acupuncture tonight which just sounds like heaven after a jam packed week… and tomorrow Becca and I are working on the podcast (and booking our upcoming Asia adventure) for the better part of the day. Whatever you’re up to I hope it’s great (and let’s hope for nice weather – this week was such a mixed bag! Spring in New York is just the best. Monica Vinader never discounts but is doing a sale in honor of the Royal Wedding!! Take 15% off with code Wedding15. I love stacking her bracelets (this, and this are favorites), this ring is one of my everyday go-to’s, and I love wearing these statement earrings on a big night. The importance of practicing gratitude (+ 8 ways to do it). I just ordered these boyfriend jeans and LOVE them. The best sunscreens, according to the pros. Liz’s breakfast smoothie sounds so good (and it’s healthy). Loving this (ultra affordable!) striped blazer. The only thing worse than ghosting. Ugh. I have so many of these!!! This brand makes such cute (affordable) dresses – I want this tropical midi! Holy moly – Alicia knows how to throw a party – this buffet looks incredible. YUM – this chicken marinade sounds really, really good. How cute are these seersucker slingbacks?! I love the colorblocking. I love Geri’s simple tip for self-kindness. Okay I know this is v. v. extra but I have been carrying around this crazy Karl Lagerfeld lip gloss and love it so much. Makes lips so shiny but also lights up! Summer Stripes at every price! These leather slides might be my next big splurge. Dressing like Meghan Markle sounds really exhausting. Two really cute summer outfit ideas – love that button back sweater! The perfect white blouse for summer. Self-Care + success go hand and hand. LOVE Merritt’s patio situation – it looks soooo good! Do I need Everlane’s trench coat? If you have it, please advise! All of the dating apps, broken down. Need this “ex boyfriend shirt” right now. Ugh now I want a hanging bed. Cute outfits to copy from Reese Witherspoon. An easy way to make friends. I love the casual stripes on this pullover. Anna has the best classic style. Such a pretty dress (and fun sandals!) on Jenn. Everyone’s favorite dress now comes in chambray! Tips & tricks for being more positive. This button up dress is super cute AND a great price – will probably go quickly! Love these classic stripes on Jess. Some really, really good packing advice. Crushing on this sweet polka dot top. Thanks Charmaine – hope you had a great weekend! Thanks for including me, Grace! I totally have you to thank for sharing those sandals as an alternative to your gorgeous Dolce & Gabbana heels! Happy Saturday! You are gonna love Cuba, it’s incredible! Like stepping back in time. I think you would really enjoy the Fabrica de Arte Cubano, it’s an enormous art gallery/nightclub that has live music and tons of cool art – so fun. 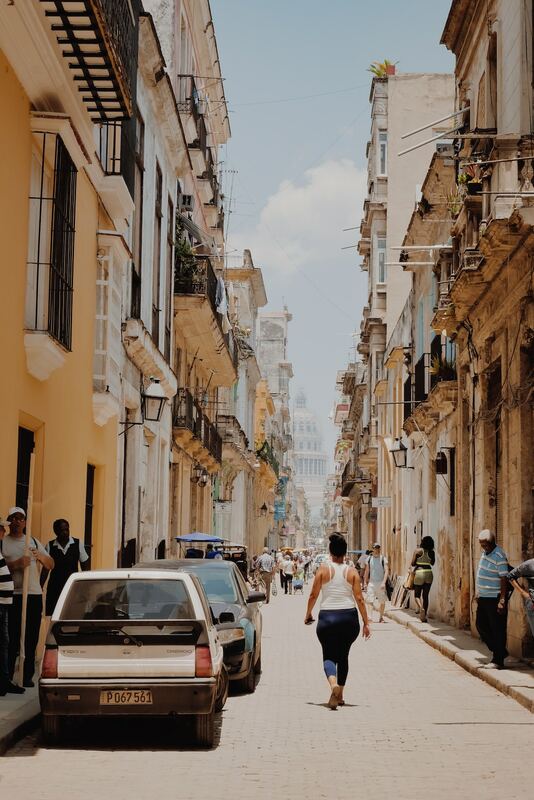 Definitely ride around Havana in an old car if you can, and spend time wandering the streets! Also unfortunately the bottled water is kinda terrible and I don’t think the tap is safe to drink so get ready to struggle in that department, we all could not wait for the flight attendants to serve us water on the plane home haha (but the mojitos are fantastic, so). The people are amazing and it’s just such a beautiful place. Have the best time! Thank you Nicole! I am so excited!!! Cuba is amazing!! I went 5 years ago, so I’m sure a lot had changed, but here are a few suggestions! Go to the Floridita in Havana and get a daiquiri. It will be super busy, but it’s where Ernest Hemingway went. If you can catch a show at the Tropicana, it’s worth it! Vinales is where the tobacco is grown. Get a tour and visit a local farm. There’s also a pretty cool hike you can do, but I can’t remember the name. I have been obsessing over yoga retreats since you said you were going to one at the beginning of the week. Cuba sounds like the perfect place to do one, plus I’ve never been and would love to check it off my bucket list. Will you be posting a blog on your experience? Would love to get details on what program you went to and how much you liked it. You know, I’m not really sure! Sometimes I feel like everything I do becomes about the blog and sharing everything I do. So it really depends – I might post, or I might just keep this just for me! If you get a chance visit 1791 Perfume Shop in Old Havana. It’s beautiful and they have really beautiful fragrances to bring home. Have a great time. You will love it. Thank you so much for the rec!! !